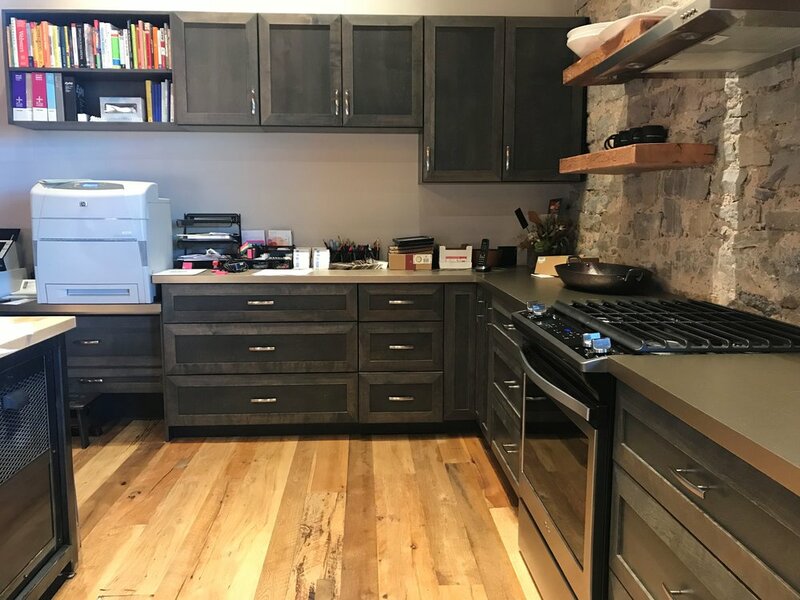 Custom Office Cabinets for Historic Oshkosh Building — James J. Calmes and Sons, Inc.
Northeastern Wisconsin marketing firm, Blue Door Consulting, recently moved to The Granary, a historic location for many Oshkosh natives. Custom cabinetry and storage solutions were needed to complete the renovated office interior. Blue Door Consulting called on James J. Calmes & Sons to design pieces to fit the modern-rustic aesthetic. The open concept office design includes a kitchen that works overtime by also providing copier and office storage space. The James J. Calmes team used inspiration pieces from Blue Door Consulting owners, to design custom cabinets and a multi-purpose island that complement the kitchen's large stonewall and arched window. With a luxe maple wood, butcher-block counter top and metal sides, the custom island table completes the kitchen. The island features pullout drawers for garbage and recycling cans plus additional storage. Seating around the island also provides both work and social seating. Now team members regularly collaborate on new project ideas while gathered around the custom-made island! Is your team planning a move or renovating an existing office space? Our team of commercial construction experts can manage your new build, renovation or office interior project. Take a look at our office interiors portfolio. Posted on December 4, 2017 by Terri Reichenberger.